Monarch Air Group provides private air charter in Budapest, Hungary. Our clients benefit from top-notch service, unrelenting dedication to safety, wide selection of aircraft, and years of experience in chartering private jets. To obtain a free quote, please use our online quoting tool provided below, or call toll free 1-877-281-3051. Monarch Air Group handles private charter flights to and from Budapest, Hungary. You can fly in and out of Budapest on one of over 15,000 aircraft types. The Budapest Franz Liszt International Airport (BUD) is located within just ten miles from the city and it is the largest of 5 international airports of the country. The most popular aircraft types include light jets (Premier IA, Citation CJ3, Citation Encore), midsize jets (Hawker 800 XP, Learjet 60XR), large jets (Legacy 600, Falcon 2000, Challenger 604). Budapest is the largest city and the capital of Hungary. It’s the commercial, political, transportation, industrial, and cultural center of the Hungary. 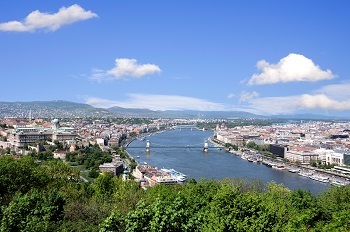 Originally Budapest was built as 2 cities Buda and Pest on both sides of the Danube River. These 2 districts still have their contrast – with older and more attractive Buda and more commercial Pest. Nicknamed “Queen of the Danube”, the city of Budapest has regal bridges, beautiful architecture, and graceful tree-lined boulevards. Budapest is rich in UNESCO World Heritage places, including the Buda Castle District, the Danube embankments, Heroes’ Square, Andrassy Avenue with the Millennium Underground Railway. The most popular attractions include the Royal Palace, Gellert Hill, Hangarian National Gallery, Chain Bridge, Great Synagogue and Jewish Museum, Memento Park, Vidam Park, Fisherman’s Bastion, Budapest Sports Arena, Great Circus, and Budapest Puppet Theater.